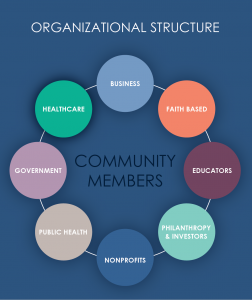 The Central Health Equity Policy Council (CHEP Council) launched in September 2015 and includes members from over 60 community partners. The Council includes policy, data, and community experts that are passionate to health issues concerning our community. All members have received training on evidence-based best practices and innovative policies from local, state and national experts. The Council provides recommendations for local chronic disease prevention policies inside the geographic boundaries of Travis County, Texas. The Council population of concern is residents of Travis County at or below 200% of the Federal Poverty Level. Efforts focus on four priority health indicators of obesity, diabetes, tobacco, and HIV. These indicators contribute to the highest number of preventable deaths in Austin/Travis County and are accountable for significant health disparities in our community. Wellness for all through health equity in our community. Identify and advance effective health equity and wellness policies for Travis County residents.